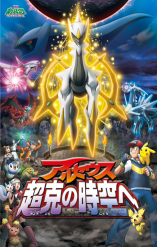 While Mizobuchi Makoto's comic adaptation of Arceus - To the Conquering of Spacetime is very close to the source material, there are a few differences between the two. The purpose of this page is to highlight those differences. Please note that a lot of the information regarding the animated version is coming from what I remember when I went to see the movie in theaters and may therefore contain errors and / or omissions. There are a number of characters who don't appear in the comic adaptation at all. 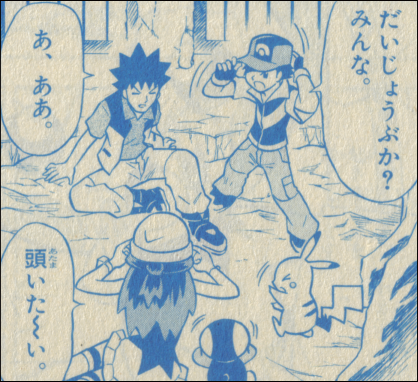 Kanta and Kako, who tell Satoshi and his friends about the Michiina ruins, don't appear in the comic at all. Instead, our heroes go there because of a recommendation from one of Takeshi's guide books. Also missing are pretty much all of Gishin's underlings who had speaking parts. This includes Tapp (the old guard who sits by and lets Damos and the others escape) and all three of the characters voiced by the comedy trio Robert. 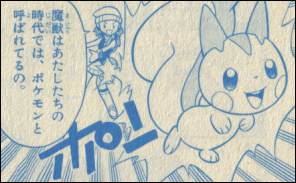 The Jouto starters are also MIA in the comic version...for the most part. Oddly enough, the trio appears in the stone slab that was made after Satoshi and his friends changed history despite not playing any role in the story as told by the comic. The purpose of the battle that takes place during the opening credits of the movie is to determine who will get to eat the watermelons that our heroes find floating down the river. 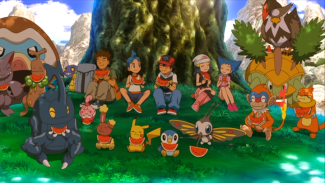 Afterwards, Satoshi and Hikari decide to just share the fruit with everyone. While the battle portion is omitted in the manga, a brief allusion to it is made in the form of the Rocket-Dan enjoying a watermelon during their first appearance. After our heroes' second time slip, they are immediately captured by Gishin and thrown in jail. In the comic, everyone is thrown into the same cell and remain there until the Notch-Eared Pichu suddenly appears - by herself - and gives the key to Damos. The movie version of this is a lot longer. Pikachu and Potchama - being the only pokemon out of their Monster Balls at the time - are thrown into a burlap sack and then tossed into a separate room with a bunch of other pokemon. The Notch-Eared Pichu enters the pokemon's cell through a hole in the wall and, before long, the three pokemon find themselves involved in a series of adventures. They come across a kitchen, where a Chicorita and Hinoarashi are forced to help cook food while a guard watches. Potchama falls into the room and gets its head stuck in an oddly shaped pot, scaring the guard into thinking it's a monster. The guard backs up and hits the wall, knocking a large pan off an overhead shelf and onto his head. As the guard is knocked unconscious, Pikachu and the others notice a strange body suit on the two Jouto pokemon. So, the two mice pokemon use their Iron Tail technique to break the devices. Freed from captivity, the two starter pokemon join Pikachu and the others. After some more Damos and Satoshi-tachi scenes, we see Pikachu and the others come across the room that appears to be used to create the silver water that will be used later in the movie. There, they come across a Waninoko who uses its Water Gun attack to knock a key off the wall. That key happens to be the one needed to open the jail cell, so the group of pokemon follow the Notch-Eared Pichu to the jail cell to deliver the key to Damos. 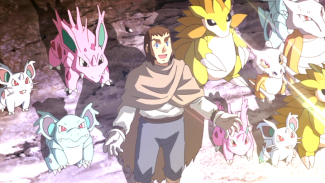 While these scenes in the movie seem to be little more than a way to showcase the cute Jouto pokemon, they do introduce the idea that Gishin is using some strange equipment to control the pokemon in lieu of Monster Balls. In the comic, however, this idea isn't introduced until the end when Pikachu frees Headran and Doutakun from similar devices. When Satoshi is telling Damos what a pokemon is, he lets his Moukazaru out of its Monster Ball to show him how they work. He quickly recalls the pokemon (instead of, y'know, using it to help them break out of their cell) and explains that this technology doesn't exist in Damos' era. Hikari watches this whole time. 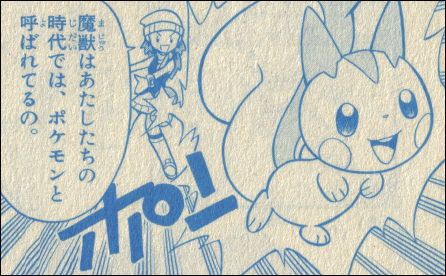 In the comic, Hikari also participates in this demonstration by calling out her Pachirisu. During Damos' recollection of how he saved Arceus' life, we see how the weakened pokemon had collapsed on the snowy ground. The legendary pokemon is surrounded by a group of wild pokemon - presumably from that area - who nervously look on to see what's going to happen. After Arceus' plates are returned to it, the pokemon around it rejoice as the legendary pokemon is revived. Throughout all of this, Damos is wearing a cape and long pants. 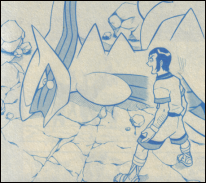 In the comic version, the group of pokemon isn't there. Instead, Arceus is by itself, with Damos being the only other living creature in the area. Damos is also wearing the same clothes he had been wearing for the rest of the comic, which is kind of strange since a short-sleeved shirt and shorts aren't the best things to be wearing in snowy climate. Thank you Sheena! But our jewel is in another staff! After Sheena tells Gishin about the events of the future, Gishin tells her that she should be the one to return the "Jewel of Life" to Arceus. 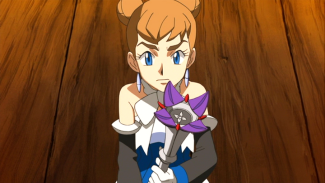 He hands her the staff that she assumes has the jewel in it, but what she doesn't know is that Gishin had clandestinely removed the jewel before handing it to her. When Sheena presents the now-empty staff to Arceus, the legendary pokemon notices that the jewel isn't there and angrily begins to attack. In the comic version, Gishin gives Sheena a copy of the jewel instead. While this may raise questions as to how he had the resources to create an exact replica in the first place, it does at least make Sheena seem a bit more intelligent than she did in the theatrical version. Why wouldn't Sheena notice how suspiciously lightweight the staff is after Gishin hands it to her? In the comic, this isn't an issue. "Just remember the advice your father gave you on your wedding day." 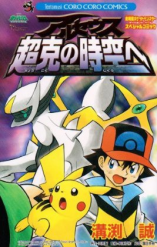 One of the many, many plot holes created when Satoshi and his friends go into the past is how, once they finally return to the present, Arceus and the dragon trio are still fighting. Like...if they had changed history to make it so that the Jewel of Life was returned to Arcues, then why would it still be fighting the dragon trio? In the comic adaptation, the trio is no longer fighting when Satoshi and his friends get back. 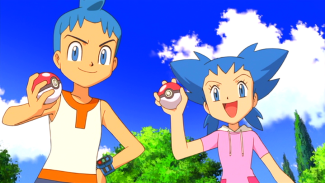 While they shouldn't have even been there in the first place since Satoshi's actions in the past should have prevented the events of the first and second Diamond & Pearl movies from even happening, at least they're not continuing to fight a battle that they no longer had any reason to be fighting.